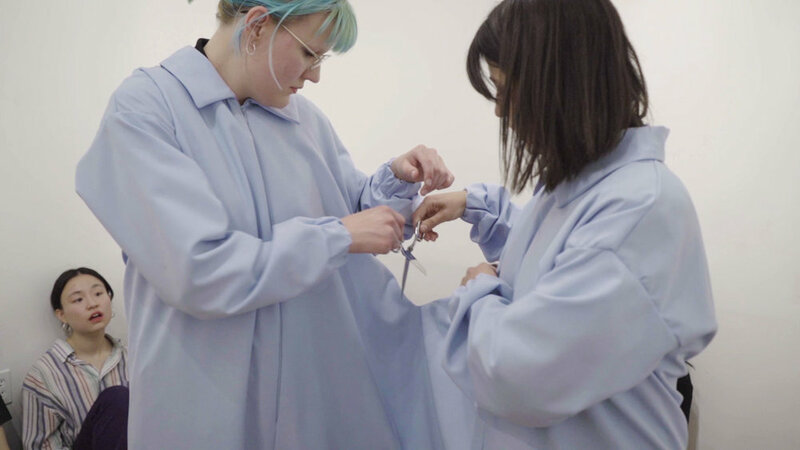 Collaborators Gloria Avgust and Marika Vandekraats come together again after a prolonged moment of separation in a performance with Number 3 Gallery at CSA Space. Companion, stemming from the latin ‘com’ and ‘panis’ quite literally means together with bread. Whilst not visibly present in the collaborative performance and accompanying publication, this idea of breaking bread remains pivotal to the project’s inception. During their time apart the artists used bread as the conduit for collaborative art making, a tie between their practices despite physical distances. Continuing a dialogue raised in past work, Avgust and Vandekraats intimately enact a series of gestures which speak to ideas of friendship, womanhood/femininity, distance and co-existence. The attached suits made for this piece situate the two artists in an awkwardly unified position. Therein they are challenged to navigate movement as they proceed to enact motions which evoke love and care towards the accompanying objects. Through moments of conjunction and separation, the performance is symbolic of the artists’ shared experience which began while Vandekraats lived in Rotterdam in 2017. Their past work considers similar interactions with the objects, found fabrics and sculptural elements which, through echoed movement, reveal the quiet intimacies that connect their practices. The accompanying publication, also titled Companion, is to embody an extension of the work, and includes photographs and conversations exchanged between the artists throughout the past year. Gloria Avgust is a visual artist currently based in Rotterdam, The Netherlands. Her practice, a negotiation between writing, performing and object making, often involves explorations on distance and intimacy. Tangling with her relationship to places, people and circumstances, Avgust aims to conclude that separation and conclusion are the two faces of the same action. Marika Vandekraats (b. 1994) is a visual artist currently based in her home city of Vancouver. She previously lived in Rotterdam, NL, where she began experimentation into performances and site-specific based work. Currently, her work focuses on the human personalities given to non-human elements in life. Through assemblage Vandekraats questions the assumed actions and expectations of commonplace objects. She pushes such expectations until the objects exhaust their own functions and begin to produce something anew. Marika Vandekraats received her BFA from Emily Carr University of Art and Design in 2016. Video still courtesy of Sahand Mohajer.